Now, I don’t know about you, but I’m one of those people who has to apply lip balm all year round. It’s more of a necessity rather than an addiction, too, as I seem to suffer from permanently dry lips. Should probably up my water intake and all that, but for now, balmy lip treats take pride of place in my collection. 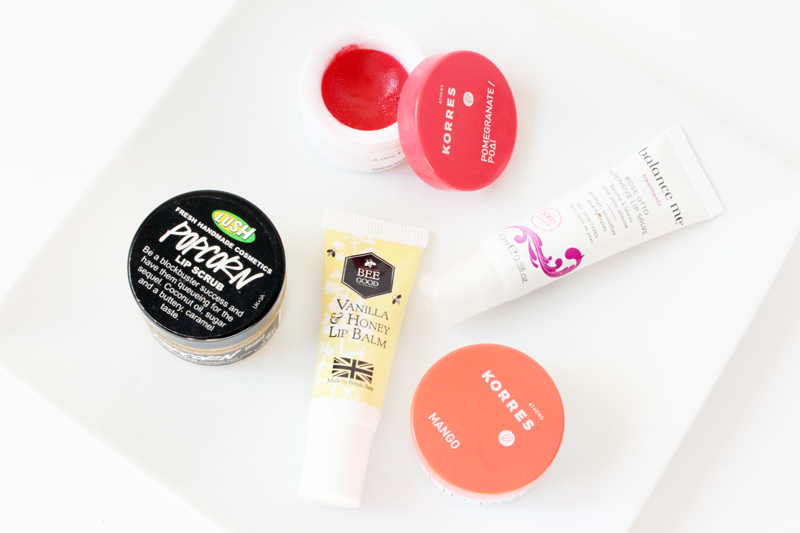 I couldn’t not mention my all time favourite Korres Lip Butter‘s as they really are worth the purchase. I have both Mango and Pomegranate and adore them equally, as they add a lovely hint of colour upon application. Nothing soothes chapped or sore lips like them, they’re buttery smooth (as the name suggests) and always leave me with hydrated, healthy looking lips. I tend to pop some on before bed, especially if I’ve spent all day in the sun (or in the cold in winter) and they completely repair my lips overnight. I couldn’t be without them! Other lip balms that have found their way into my routine are the Bee Good Vanilla and Honey Lip Balm and the Balance Me Rose Otto Intensive Lip Salve. The Be Good number has been firmly kidnapped by my mother recently, but she (and I) think it’s a darn good one for topping up your lip care throughout the day. Plus, it smells like vanilla, which is always delightful, and is very softening so it’s a bit of a winner. Of course Balance Me had to find their way in here, being one of my all time favourite skincare brands, and their Lip Salve is such a lovely product. It smells of roses, but in a natural and not overpowering (or old lady-ish) way, and applies like a dream. Perfect for slicking on under lipstick or whenever needed.